Pre-Heat ASC30: Pre-heating auto sample changer ～ Easy, safe and convenient auto sample changer system ～ | Applications | JEOL Ltd.
Pre-Heat ASC30*1 is designed for polymer research. Pre-Heat ASC30 heated is capable of keeping 12 samples at up to 160°C*2. 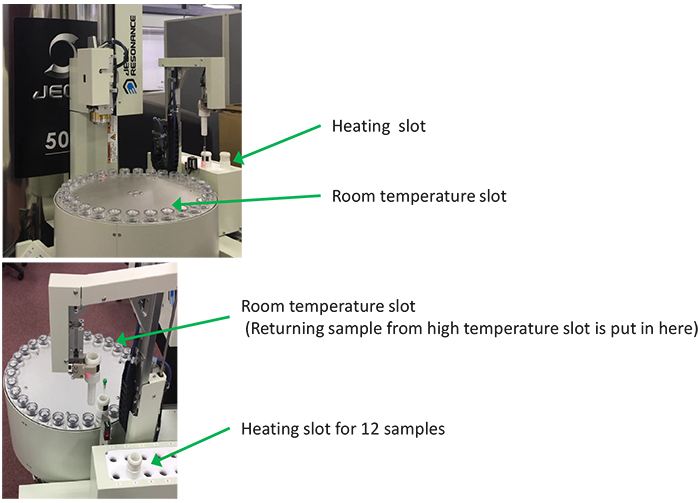 This heating slot is completely independent from the carousel (conventional room temperature sample slot), and room temperature sample is available together without any special manual handling*3. Ensuring simple random access automation without the need for steps or ladders, since sample transport system is fully controlled from software and verified by sensors for the safety. *1: There are cases in which the schedule is changed without advanced notice. *2: Sample temperature is less than controlled temperature. *3: After measurement, the sample is cooled at atmosphere.